Seeing figs at the farmer’s market is a bittersweet thing. On the one hand, I love figs, and I’m almost out of Sticky Fig Jam, so I’m ready to get moving to make some more. On the other hand, the arrival of figs means the end of summer, which is always a sad time for me. 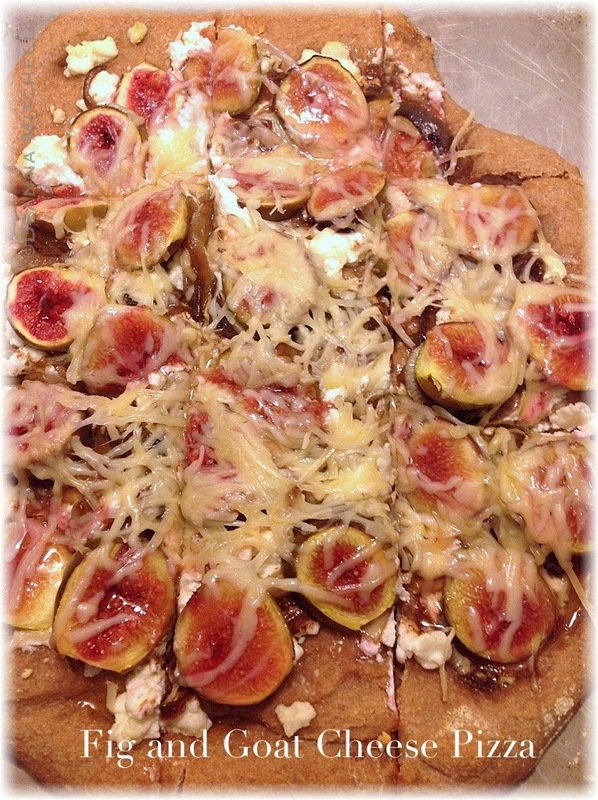 Recipes like this Fig and Goat Cheese Pizza give me a reason to smile, though! This pizza is incredibly simple and very, very tasty. The way the end of summer should be, right? For this pizza, I used fresh, local goat cheese and onions and figs from our farmer’s market. The onions in this recipe are caramelized quickly using a “cheat” of vinegar and sugar, but you can skip the sugar if you want–it gives the onions the flavor of caramelization without the long cooking time, but you can do what works for you. Don’t skimp on the balsamic vinegar though–the pairing of the vinegar with the onions and the cheese is pretty spectacular. We used coconut sugar in our recipe, mostly because we have it handy and I am totally in love with it. It is sustainably produced and has a flavor almost like brown sugar, but is minimally processed and closer to a natural state. I wouldn’t buy it just for this pizza, but it’s worth trying in all kinds of baked dishes. Prepare pizza dough and let rise according to recipe directions. In a medium size skillet, heat the olive oil over medium heat. Add onion and cook over medium heat for about 5 minutes or until translucent and soft. Sprinkle with salt to help the onion release its juices (this will help keep it from browning too fast). Reduce heat if onion starts to brown or burn. Add balsamic vinegar and sugar to the onion, reduce heat to low and let simmer for about 20 minutes. Stir frequently and make sure onion does not burn. Stretch and shape the pizza dough into your desired shape onto a baking sheet or pizza stone (our pizzas are almost never really round, and we are okay with that!). Mash the goat cheese and distribute evenly over the pizza dough surface. Top the goat cheese with the caramelized onions. Arrange the fig slices on top of the goat cheese. Top the pizza with the Parmesan cheese. Bake at 400 degrees for 12-15 minutes or until the crust is cooked and the cheese is bubbly and melted.